There are now 94 iPhones sitting at the Futian crossing in Shenzhen, a southern Chinese metropolis bordering Hong Kong after an attempt at smuggling these iPhones into Hong Kong. Officials say a man caught the attention of custom officials when he looked like he was carrying a heavy load on his body underneath his clothing, but was traveling light as far as luggage was concerned. The two plastic bags he traveled with had nothing suspicious until he had to pass though a metal detector, from that point on things started going downhill. 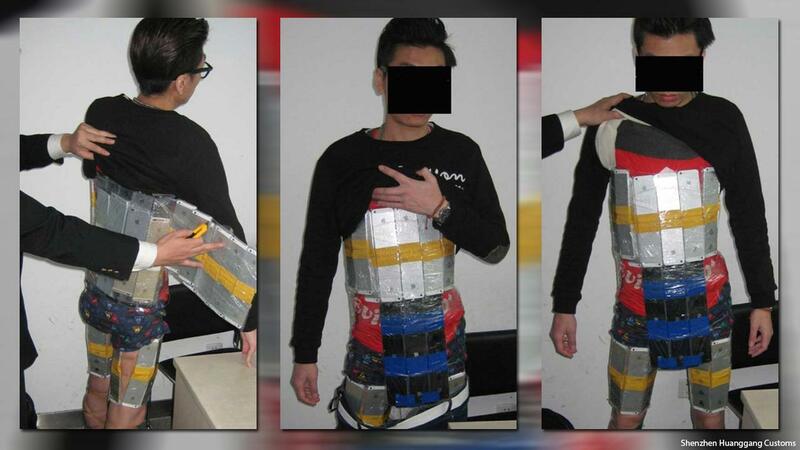 The man was found with 94 shiny iPhones shrink-wrapped and strapped all over his body, held together with duct tape. The iPhone 6 and 5s models that he was carrying on him had an estimated total value said to surpass 300,000 yuan which translates to $49,00 U.S. dollars. It was then revealed that the man had a previous record with customs regulations. The popularity of iPhones in mainland China is very high. Just in the month of October, it took roughly 6 hours for customers of the country’s 3 mobile carriers to order one million units of the iPhone 6 and 6 plus, before their official launch. On account of higher import taxes, Apple handsets are more expensive in the mainland than Hong Kong. An iPhone 6 with 64 GB sells for almost a grand in the mainland but only around $800 in Hong Kong. Shenzhen customs officials have busted 18 mules strapping electronic products on their bodies since December. The Hong Kong mule caught on Sunday the 11th, lost the 94 iPhones but will certainly be remembered.